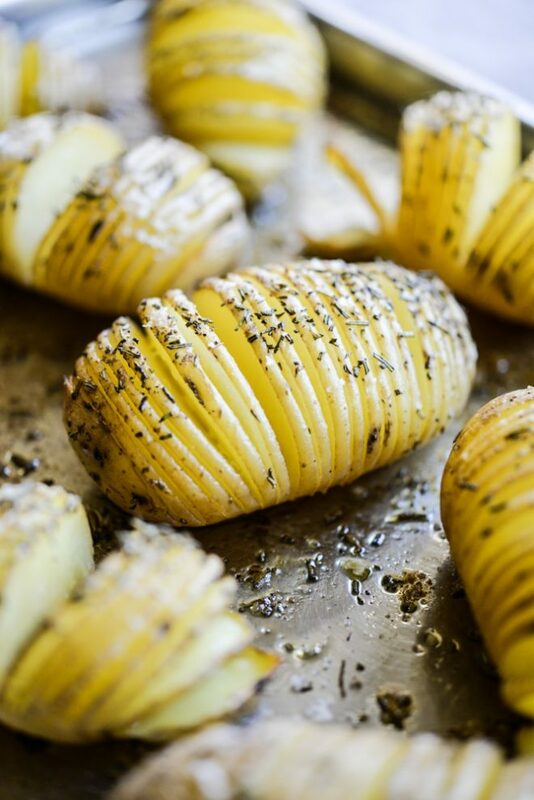 These Rosemary Sea Salt Hasselback Potatoes are a perfect combination of crispy and baked potato. I walk you through my trick to cutting the potatoes so that you have even thickness all the way through. 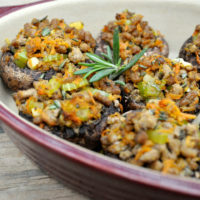 These will make the perfect side dish to any meal, fancy or every-day! You know what you deserve? You deserve to be LAUDED for your kitchen skills. You really do. You work hard, you put a lot of thought into your meal planning, and you chop, stir, and saute with love. Preparing a delicious, nutritious meal takes effort and I want you to be PRAISED for it! Now, our families may not always remember to praise our efforts when we whip up something in our usual rotation (totally normal). But when we put a new spin on an old food, it tends to turn heads and (you guessed it) provoke praise. 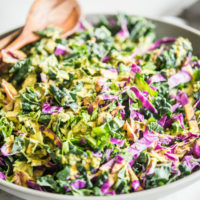 THAT is my goal for you with this recipe. 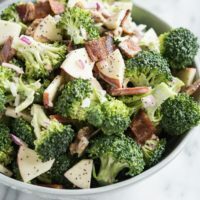 Even though these potatoes are made with perfectly simple, seasonal ingredients, they're special and praise-provoking. 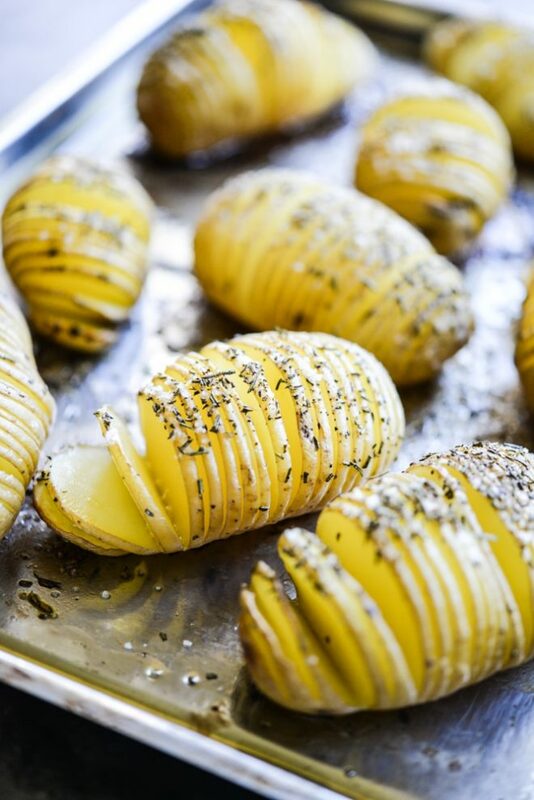 Hasselback potatoes are potatoes that are cut about 1/2 to 3/4 of the way through and THEN buttered + seasoned. They're baked and, because of the lovely slices, result in part crispy potato goodness and part baked potato. They're magical and your dinner guests will applaud your skills. Place the potato between two cutting boards of equal thickness. Run your knife down through the potato until it hits the bordering cutting boards and then stops. Proceed with thin slices (about 1/4 of an inch apart from each other). Drizzle with melted butter, sprinkle with sea salt + herbs, and bake until they're golden and perfect. To serve, I recommend doing so warm! A little spoonful of crème fraîche or sour cream with a few chives sprinkled in would be a lovely addition. 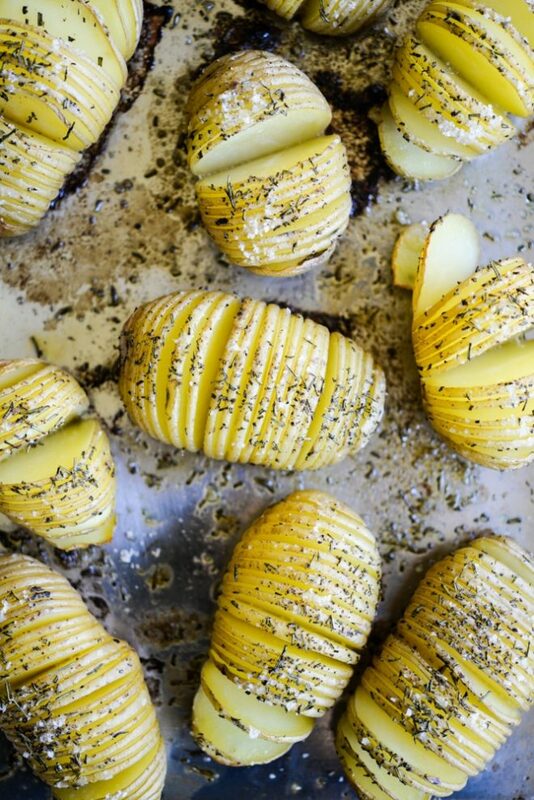 I hope you enjoy these potatoes and I hope that, EVEN though they're pretty simple, they help you get the kitchen recognition you so rightly deserve. Yum! I am a little confused about your trick for cutting the potatoes. Any chance you can post pictures of how you do it? Thanks! + 1 … unsure about how thos is set up. Chopping boards are both flat/horizontal or standing up? How does it all hold together when slicing? Perfectly put, Sara! Thank you! 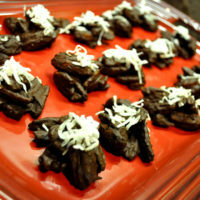 I am making these tonight. They are in the oven right now and they smell so good. 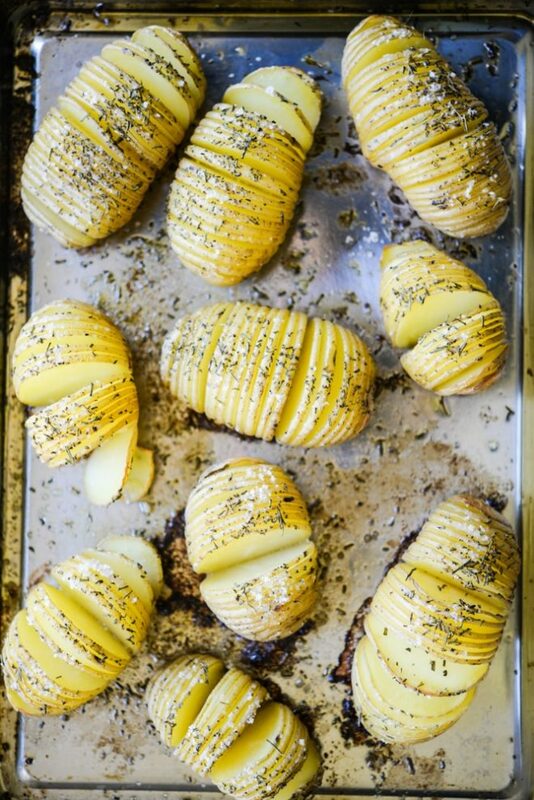 I have never made Hasselback potatoes because I was intimidated by them, but this was SO easy.